JSC “BALTIC COAL TERMINAL” is a nature-friendly coal transshipment terminal in the region of the Baltic Sea. The company is constantly improving its activity and the process of service supply to raise the quality and minimize the influence on environment. Annually the company invests sizeable sums of money in improvement of technologies, infrastructure and environmental protection measures. JSC “BALTIC COAL TERMINAL” especially cares of compliance of requirements and standards of quality and safety and is responsible for the quality of provided services. Obtained Certificate ISO 9001:2015 approves the company activity in the sphere of quality management. The Certificate approves that the company works effectively and constantly improves its quality management system. It is an approval that the company corresponds to the highest-level quality as for clients, so for the interested individuals. It also approves that the company staff consists of the highest-level professionals. Whereas Latvian Maritime administration Certificate approves company’s security system correspondence to International Ship and Port Facility Code (ISPS code). 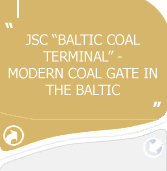 JSC “BALTIC COAL TERMINAL” has received the termless B category licensing Nr. VE14IB0003 of polluting activity when transshipping coal and pellet plant feed in volume of 10.5 mln tons annually. • Public attention and support. 2018 © JSC "BALTIC COAL TERMINAL"